In one of the most iconic experiments in neurology, Arvid Carlsson showed in the 1950s that rabbits were tranquilized after injections with the antipsychotic drug reserpine and that this state was reversed after they had received dl-DOPA. He published these results in a landmark Nature paper in 1957 and went on to conclude in the following years that l-DOPA would alleviate the syndromes of Parkinson´s disease. These findings earned him a share in the Nobel Prize in 2000, added a new chapter to the prospering CNS research activities in the 1950s and opened the gate for further investigations and ultimately the clinical investigation of the treatment of Parkinson´s disease in the 1960s. During these eventful times, scientific journals devoted exclusively to uncovering the biochemical mechanisms of neuronal transmission were scarce but there were some activities centred in Vienna, Austria, where Walther Birkmayer (1910–1996) and Oleh Hornykiewicz (*1926) were conducting seminal investigation on the role of L-DOPA in parkinsonism in the early 1960s. Birkmayer, who directed the Neurological Division of the Vienna Municipal Home for the Aged at Lainz Hospital where he had recorded the first L-Dopa trials together with Hornykiewicz in 1961, was a board member of several journals, including Acta Neurovegetativa (AN). AN was founded in 1950 by the Austrian anatomist Carmen Coronini (1885–1968) and the German physician Alexander Sturm (1901–1973) as a journal devoted to neurovegetative anatomy, physiology, pharmacology, and pathology with the adjoining areas of endocrinology, with a special focus on clinical medicine and original experimental papers addressing neurovegetative problems. The Vienna branch of Springer was its publisher and the third editor alongside Coronini and Sturm was E. Anderson (1954–1967) from Moffett Field (CA), USA, giving the journal an international reach from its very beginning. Manuscripts were submitted in four different languages (German, English, French, and Italian) and were collected by Carmen Coronini in Vienna and Alexander Sturm in Wuppertal. AN soon developed a noteworthy standing for publishing high-profile articles on neurovegetative issues. 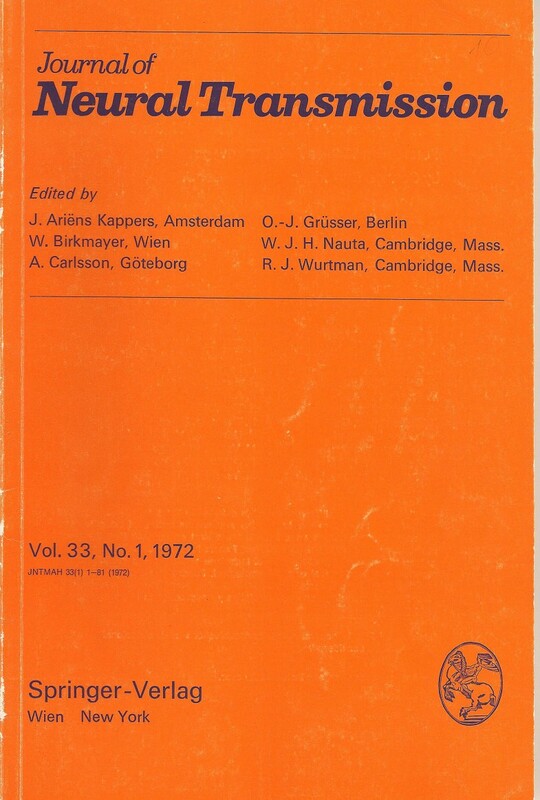 J. Ariens Kappers played a prominent role in the development of the journal in the 1960s, serving as editor from 1963 to 1975 and editing a noteworthy supplement volume on the Symposium of Neurohormones and Neurohumors held in Amsterdam in 1967. In all, AN appeared in 30 volumes until 1967. 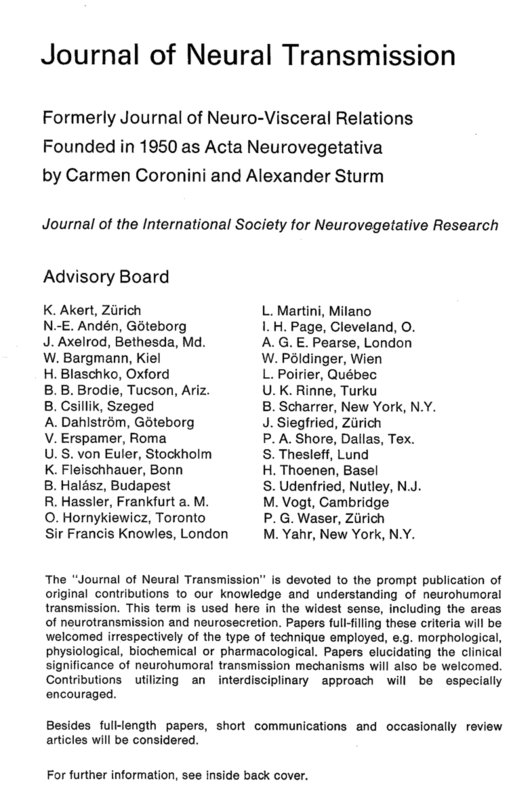 A first important thematic shift occurred in 1968, when Acta Neurovegetativa changed its name to Journal of Neuro-Visceral Relations. Walle Nauta (1916–1994), a leading neuroanatomist at MIT in Boston, USA, had initially recommended a new title for AN to better suit not only its American audience but, more importantly, its broader focus on the multidisciplinary study of the autonomic nervous system and of neuroendocrinology and its aim to encompass any form of communication between the brain and the viscera, nowadays a topic of great interest and importance. Its Editors were J. Ariens Kappers (1968–1972), Walle J. H. Nauta (1968–1972) and K. Fleischhauer (1970–1972) and it appeared from 1969 to 1971 with Supplements published as books. By the end of 1971, the journal had sold 425 subscriptions. Nevertheless, the acquisition of scientific papers did not entirely fulfill initial expectations and it was decided that a more comprehensive reorganisation of the journal was necessary. Throughout 1971, bilateral negotiations took place under the leadership of Walther Birkmayer and as one part of the strategic shift he suggested inviting Arvid Carlsson to join the Editorial Board. 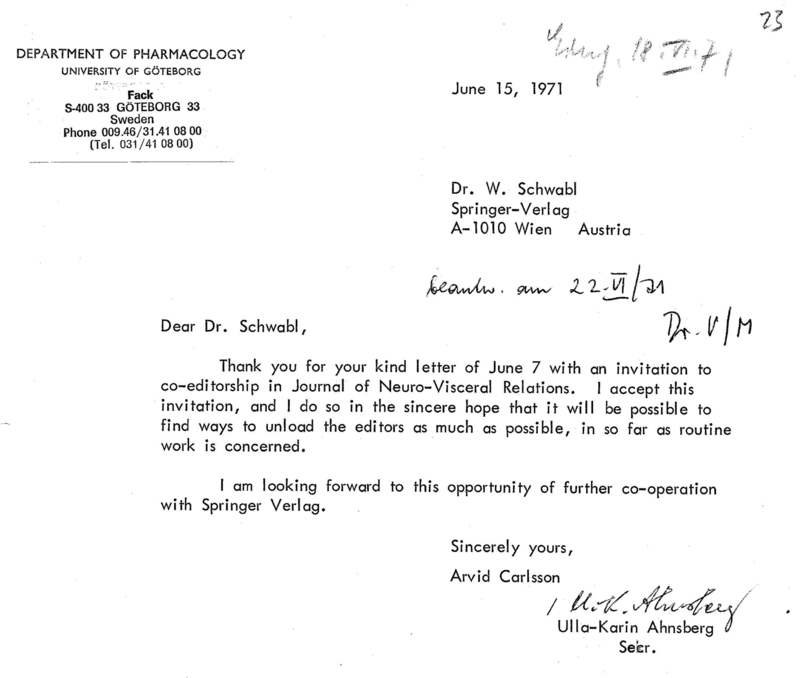 In a letter from June 15, 1971, Arvid Carlsson agreed to contribute his pharmacological expertise to the venture. 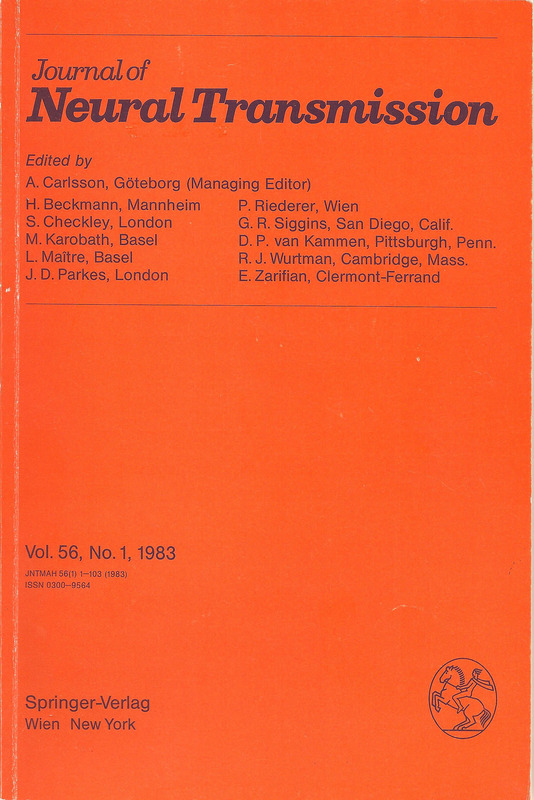 At a meeting in the autumn of 1971 in Vienna, Carlsson, Birkmayer, and Fleischhauer then discussed fundamental changes including a new title for the journal. Arvid Carlsson initially proposed “Journal of Neurohumoral Transmission” and advocated including more experimental neurologists working on neural transmission, a field that was gathering increasing attention in the scientific community. In 1972, the stage was set for the third evolution. 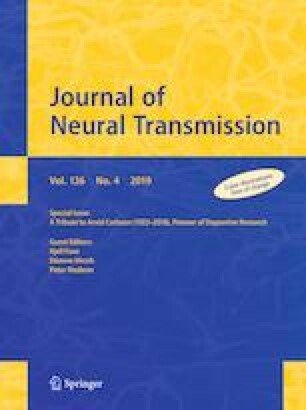 The remodeled Journal of Neural Transmission, “devoted to the prompt publication of original contributions to our knowledge and understanding of neurohumoral transmission,” started with its first edition (Vol. 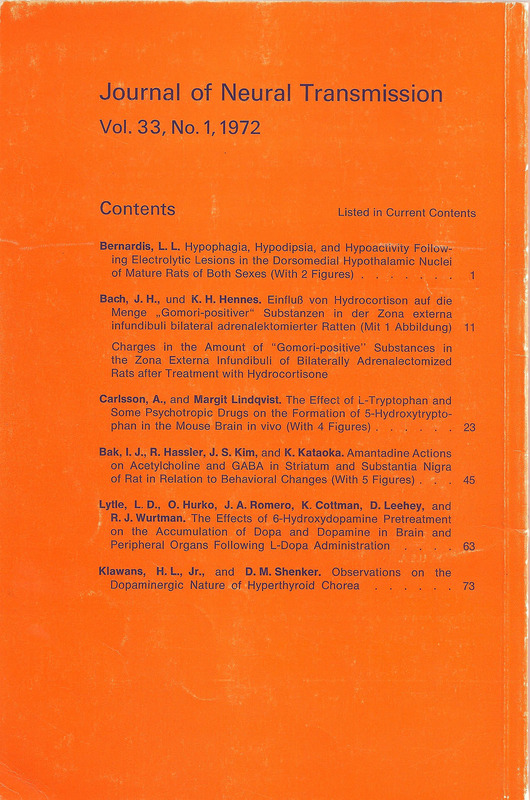 33, Issue 1, 1972) and six scientific articles. It was stated that the journal “is issued at indefinite intervals and consists of loose numbers, for subsequent assembly in volumes”. Surprisingly, no Editorial was published announcing and explaining the new strategy. The journal kept its initial A5 format and its emblematic orange cover. Authors received 100 reprints free of charge and were allowed to purchase additional reprints. Beside Walther Birkmayer and Arvid Carlsson, the Editorial Board consisted of J. A. Kappers, W. J. H. Nauta, O. J. Grüsser and R. J. Wurtmann and an Advisory Board with 30 renowned experts was introduced. Birkmayer himself took over the position of Managing Editor from Fleischhauer, relocated the editorial office back to Vienna (it had moved to Amsterdam in 1966, where J. A. Kappers worked) and Birkmayer’s collaborator Peter Riederer (*1942) was appointed Editorial secretary of JNT in 1973. From the very beginning, the “new” JNT encompassed leading physiologists, pharmacologists, and clinicians and the journal started to thrive throughout the ensuing decades. One of its early supporters was Melvin D. Yahr (1917–2004, New York), an internationally renowned physician specialised in movement disorders. His proposal to give greater coverage to Parkinson´s disease led to a fruitful discussion in the 1980s on how to better categorize different emerging fields within JNT. Ultimately this led to JNT being published in two different sections, a General Section for Basic Neuroscience and a section on PD and Allied Disorders (headed by Melvin D. Yahr from 1989 until the summer of 2003). For a couple of years, each of the two sections was published as a separate book. In 1983, starting with Vol. 56, Issue 1, Arvid Carlsson took over the responsibilities from Walther Birkmayer as Managing Editor. His appointment was accompanied by some structural and thematic changes. The board of editors was enlarged to 10 (excluding Carlsson as the managing editor and including Peter Riederer as a new board member) and the journal re-emphasized its commitment to the “interface between basic neuroscience and clinical neurobiology”. It also strengthened its focus on psychiatry and psychiatric disorders. Carlsson himself was a prolific author and contributed some well-cited articles in the 1980s. With the help of Springer, the format was enlarged to A4 in the late 1980s, subscriptions tripled, published articles doubled and the journal appeared monthly with supplements on special topics complimenting its regular scientific offerings. Arvid Carlsson led the journal until 2000. In recognition of his long-lasting commitment and achievements he was named “Honorary Editor-in-Chief” and passed his duties on to Peter Riederer, who has continued to lead JNT until today. JNT is electronically available at 9000 + institutions worldwide and continues to be a thriving scientific journal.